A new feature added and we called it “Coupons”. Now user can apply coupons in his account. Coupons will give user “Coins” or “Skills”. 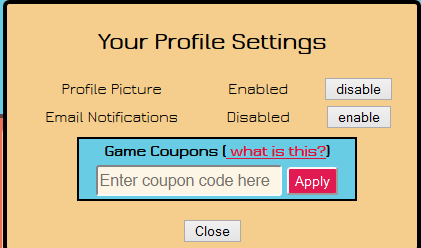 To apply coupons, Login to game and go to “settings”. here you can see a box asking for “Coupon Code”. Enter the Code and press “Apply” , coupon will be applied to your account.